Scrangie: Some requests and some nail art. I don't have a whole lot of time to post this morning, but I'm really behind on my requests and I wanted to make sure I got these posted! Index to pinkie: OPI Parlez-Vous OPI?, China Glaze Who's Wearing What, China Glaze Channelesque, Pure Ice Taupe Drawer. They all look really similar in the bottle, but they're much different than I expected when you apply them! And, in all my infinite wisdom (*snort*), I forgot to include OPI You Don't Know Jacques and Sephora By OPI Call Your Mother and Metro Chic in the comparison! D'oh. Another great request for a comparison I wouldn't have thought of myself! These look nearly identical in the bottles, but as you can see, they're quite different on the nail. Both are gorgeous, do I don't know if I'd ever be able to pick between the two! The eyeshadows are excellent. Absinthe is the standout color, a very bright golden green with shimmer. No complaints there. The packaging, however, is really crappy. The eyeshadows are in a pull-out drawer that fits so tightly it's a struggle to open. You have to open it by a tiny little ribbon, and since you have to pull so hard to get the drawer open, I can imagine that delicate little ribbon getting torn off pretty easily. The brushes are floppy and useless. Bah. And, my major irritation with this is the stupid "pop-up" top flap.... WTF are you supposed to do with that?? It doesn't stay open so you can't use it as a mirror.... It's just.... useless! They should have put the shadows up there instead of in the stupid drawer! So, final verdict: Awesome shadows, crappy packaging. I tried taking the picture in a different part of the house, but I think the lighting turned out weird. Hm. That's it as far as requests go- I'm working on a really big project right now, but I think it will help me respond to requests a lot quicker! I know a lot of you are still waiting on requests, but I didn't forget about you, I promise! And, for fun, here's a little nail art. 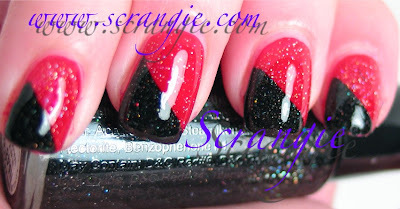 China Glaze Gypsy Girl, China Glaze Fairy Dust, Art Club Black Hologram. This was a touch darker in real life, and it looked awesome. Sparkly and eye-catching! For some reason I can never photograph reds. They always come out looking weird and too bright and glowy. Reds, oranges and neons. I don't know what it is! Argh. 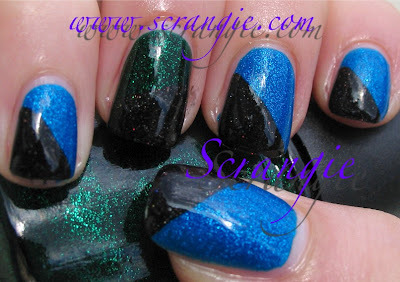 China Glaze Blue Sparrow, China Glaze Emerald Sparkle and Art Club Black Hologram. I really like this shape- it's not quite a french but it's not quite half-and-half either. I love the way this looks when the light catches it too- tons of sparkle. I'm getting that shadow box for Christmas!! Can't wait! I love UD shadows IMHO they're better than MAC. I love tulipe noir it's one of my all time favourite shades even though chanel polishes chip so easily on me. Which nail polish brand would you say is your all time favourite? Thanks for the comparisons and swatches! Although I don't own either, judging from the pics I think I like Tickle My France-y better than Grunge...which is fabulous news for my wallet. What has not been good for my wallet is my decision to finally make a transdesign order in addition to hitting Sephora by OPI yesterday. Payday comes but once every two weeks...and then I blow my money on polish. Hehehe. Also, are Channelesque and Metro Chic similar at all? --> I just wanted to share with you that it took me a while to figure out what you meant. (Ehh?? Left thumb and right thumb?? But there's only 1 thumb!!) mmmyeahhh. *cringe* i'm not usually this slow. honest. To me they look so alike when I see them one by one, but side by side they´re not even similar. You saved me some money here. I got PVO and I´ll leave it at that, seeing that it´s really my favorite one of the bunch. I need Chanelesque now too! I love the shadow box !! I love the nail art! Woo woo! hi scrangie i have a question. i love essie for their colors but they are not big three free. i dont know what are the risks of using nail polish that have these chemicals in them. did you know about essie containing the big three? would you still use essie? i am so indecisive. Atomica, YAY!!!! It's soooooooooo beautiful, it's unreal! Lydia, yay! :D They're all so nice, I bet you'll love 'em! Oh wow! i liked most the chanel tulipe noir...amazing! when you say all essie with blue labels are big three free, you mean the labels at the bottom of the bottle? where it tells the name and the ingredients? Hallie, yep, that's the one! :) Instead of black ink it will have blue. I'm pretty sure all new Essies will be 3-free. Ooooh TYFP! Do you have SOPI Metro Shic to compare w/ the other purples? Hmm... the Pure Ice Taupe Drawer might be what I am looking for. I passed on that new Borghese grape color because of the price. 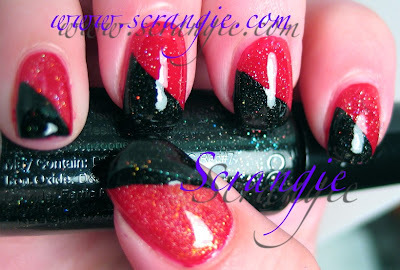 Beautiful job on the art, Scrangie, and I covet your Rouge Noir! And I'm tottaly digging the green/blue/black mani you did @the end. Perfection! Firepail, you're very welcome :D And thank you! I'd love to be a hand model, I wonder how hand models get hired? I LOVE LOVE the slanty half colour thing you've done. Would you mind letting me know how you did that? I am assuming you used some sort of tape (?) to cover half the nail to do that first colour? If you could provide a quickie tutorial I'd be so greatful! I looked at the Box of Shadows in the store the other day, and I agree. It's pretty and all, but I'd rather get at my makeup easily. Have you seen the Sustainable Shadow Box? Still a great color selection, but much easier to get at. Oh I also got the 24-7 Liner Travel Size set in VIP. It's awesome sauce. Just the right size to stick in a purse or small make up case. HoneyHoneyNY, I did see the Sustainable Shadow Box, and I was contemplating ordering it until I realized I had all the shadows that were in it except one. :D I wish they didn't duplicate so much in their palettes! I'm definitely going to get the new 24/7 set in Velvet Rope- I loooooove the 24/7 liners!!! 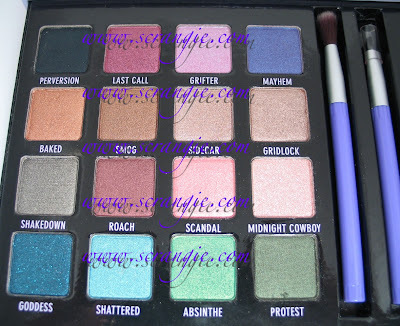 I really like Urban Decay's products, but their packaging has sucked for me almost across the board. The plastic "bubble" covering the lid of my Ransom Deluxe Shadow was always falling off, the metal lid to my Lip Gunk came unglued from the plastic inset/applicator, and Primer Potion has the infamously wasteful bottle design. 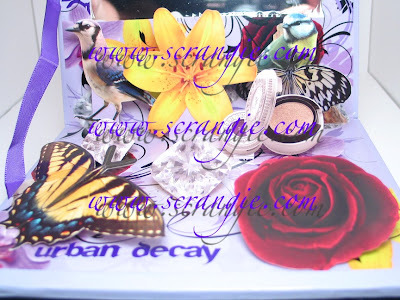 If Urban Decay would make their packaging more solid, I'd spend more money on them. Jocelyn, I completely agree. It seems they go more for "cute" than "functional." I have stopped using Urban Decay Primer Potion for that reason! Too Faced Shadow Insurance is waaaay better anyway :) I especially hate the new lipstick tubes! For one they're really fat and take up much more space than a 'regular' lipstick, and secondly they're very hard to open- you have to pull on that stupid little dagge and it's SHARP! I don't know what they were thinking. Yep, UD definitely seems to favor cuteness over function. I haven't looked at the UD lipsticks in person, but the dagger design does look literally painful to deal with. A tip to you about Urban Decay's "Book of shadows"; pull the drawer all the way out, and remove the rubber-string that's glued to the inside of the box, then you won't struggle so much with pulling the drawer out!! 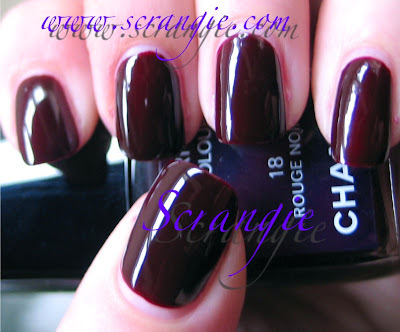 I wonder is Chanel Tulipe Noire by Chanel is similar to La Bohema by OPI? Wine Me & Dine Me? How do they differ? Anonymous, WOW thank you for that tip! I'm going to do that right away!! Chloe, La Boheme is a lot more interesting that Tulipe Noire- it's a red shimmer with green and gold flash, super pretty.